OM International - Canada Visa specialist providing services over 15 years in the field of immigration Visas, Student Visas, Visitors Visa, and Business Visas. The immigration landscape of North America is constantly changing. Canada and the United States, to a large extent, followed parallel trajectories in the earlier parts of their immigration histories. Both countries initially drew principally on migrants from the British Isles and Europe, before expanding their catchment area to other regions of the world. Over time, however, Canadian and U.S. immigration policies have diverged in significant ways. Immigration issues are in the news in both countries these days, perhaps more so than usual. Canada is in election mode, with many new Canadians expected to vote for the first time. Meanwhile in the United States, a combative Republican Presidential nominee contest, led by the enigmatic Donald Trump, has placed immigration policy to the fore. But what are we really talking about when we talk about immigration? 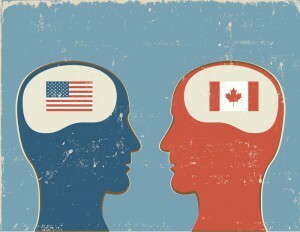 How does Canada differ from the U.S.? This article will present five fundamental ways in which Canadian immigration policy is different from that of the U.S.
1. Canada favour’s economic immigration. Around two­ thirds of new Canadian permanent residents arrive through economic immigration programs. In contrast, only 16 percent of new Green Card holders (lawful permanent residents, or LPRs) in the U.S. arrive through economic immigration categories. Politicians and commentators in other countries continually point to Canada’s points ­based economic immigration as a shining example of a positive, open immigration strategy that creates opportunities for newcomers and Canadians alike. Sources: Department of Homeland Security, Citizenship and Immigration Canada. U.S. figures are for 2013. Canadian figures are projected for 2015. The Diversity Immigrant Visa program, also known as the Green Card lottery, is a lottery program for receiving a U.S. Permanent Resident Card. Canada has no such program. In 2014, the Green Card lottery attracted more than 11 million applicants. From this pool of applicants less than 0.5 percent were to receive visas, which are allocated at random in a single annual draw. With odds of less than one in two hundred, applicants generally enter the pool of applicants in the Green Card lottery more in hope than expectation. Canada has its own sort of pool — the Express Entry pool, which came into operation earlier in January, 2015 — where candidates who have made an Expression of Interest in immigrating to Canada are ranked according to a Comprehensive Ranking System (CRS). OM International is Vadodara's leading consultants who can help you with Federal skilled visa applications, along with all the provincial nominee programs and also Federal trade worker visas too. While not everyone is eligible to enter the Express Entry pool, the same is true for the Green Card lottery. The major difference, however, is that individuals presently ineligible to enter the Express Entry pool can become eligible through their own endeavour by improving their language ability, adding supplementary work experience, and/or completing a higher level of education. Applicants to the Green Card lottery, on the other hand, are at the whim of a program that only allows candidates from certain countries to enter, and that’s before the randomness of the draw itself is taken into account. In Canada, the federal government and the provinces and territories share jurisdiction over the selection of immigrants. Provinces and territories can create and tailor Provincial Nominee Programs (PNPs) that allow them to nominate individuals who are deemed likely to contribute positively to the community, both socially and economically. OM International can help you out with the filing of your Provincial Nominee immigration applications. Come and visit our professional staff who will cater your needs and help you out at every stage of the application. The federal government then attends to health and security matters before issuing the permanent resident visa. The PNPs are a dynamic set of programs that fast­track the entrance of newcomers who arrive in their new homes knowing that the region in which they are settling wants them there. Indeed, these newcomers are actively pursued by the provincial governments. The 50 U.S. state governments do not benefit from such a decentralized system, however, with immigration jurisdiction remaining exclusively with the U.S. federal government. When Mitt Romney was running for President of the U.S. in 2012, he stated “If you get an advanced degree here, we want you to stay here – so we will staple a Green Card to your diploma.” Alas, post­graduation work and immigration options for international students in the U.S. remain scant to this day, with many graduates effectively forced to leave the country soon after graduation. Om international can help you select best suitable course and then the best collages where there is world class amenities and state of the art class room and highly educated teachers. These individuals take with them their ideas, creativity and know how and use it elsewhere — very often in Canada. In turn, the U.S. loses out on a potentially high earning tax base. In contrast, Canada offers its cohort of international students something that is not available, or more difficult to obtain, in other countries — a post graduation work permit for up to three years. International students who go down this route also benefit from permanent immigration options, including the Canadian Experience Class and the Quebec Experience Class. All of this allows Canada to retain top talent. A Green Card is the popular name for a United States Permanent Resident Card. Instead of a Canada Green Card, permanent residents of Canada have the right to a Canada Permanent Resident Card as proof of their Canada immigration status. The distinction is not a question of semantics; there is a significant difference in the philosophies behind the issuance of a United States Green Card and a Canada Permanent Resident Card. OM International also helps you with immigration to the united states. we have professional who are expert to handle every of your immigration queries. A Green Card grants the holder the permission to enter and live in the United States. In contrast, Canadian permanent resident status grants an individual the right to enter and live in Canada. Having permission and having the right are two distinct claims. A right is something more — it is a legal entitlement, inherent to the holder. Permanent residents of the United States must be in possession of their U.S Green Cards at all times and must be prepared to show them to U.S. authorities upon request. Canada permanent residents have no such obligation. Not only do they not have to carry around their Canada Permanent Resident Card, they are not even required to apply for the card. Though useful to have, a Canada Permanent Resident Card is purely voluntary.